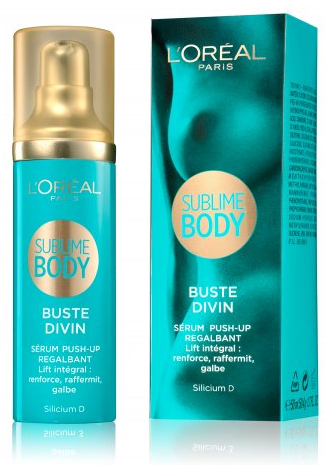 L’Oréal Paris launches in March 2012 a new range of bodycare : Sublime Body. These products are three elements of a three step body routine : “erase cellulite”, “sublimate skin” and “shape bust”. Formulation are not new, but well built. The packaging of the products are quite luxirious, with the use of golden elements (cap, pumps, logo). 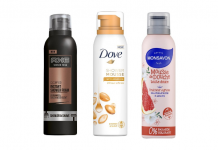 This new range seems to be a new attempt to talk about body products for L’Oréal Paris, with a concept less oriented on measured efficiency (few figures), and more oriented on pleasure and complete care/routine for the whole body shaping question. Formula presented as a “push-up” serum for a “complete lift : strengthens, tightens, shapes”, with “Silicium-D” as active ingredient, very probably corresponding to Exsymol Algisium C (Methylsilanol Mannuroate). 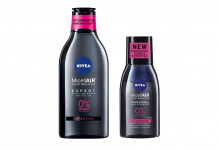 The tightening effect sensation is reinforced by the formulation technology used – an emulsified gel with very few oil phase, which gives freshness when applied on skin – and by the use in the formula of a film-forming polymer (PVM/MA Copolymer) and a cooling agent (Menthoxypropanediol). – Hydroxyproline : could be supplied by Evonik. It is an amino acid derivative and a major component of collagen. It is classified as a “skin conditioning” ingredient. – Methylsilanol Mannuronate : corresponds to Exsymol Algisium C. It is a semi-natural silanol, with the following biological properties : cytostimulation, anti-wrinkles, anti-strech marks, anti-inflammation, anti-free radicals, anti-glycation, lipolysis, and collagen production. – Panthenol : pro-vitamin B5, with humectant, emollient and moisturizing properties. It would “improve hydration, reduces itching and inflammation of the skin and accelerates and improves healing of epidermal wounds“. – Hexylene Glycol (and) Glucose (and) Fructose (and) Sucrose (and) Urea (and) Dextrin (and) Alanine (and) Glutamic Acid (and) Aspartic Acid (and) Hexyl Nicotinate : corresponds to CLR Hygroplex HHG : claimed to “readapt the physiological moisture balance”, containing “ingredients similar to Natural Moisturizing Factors (NMF)“. O/W Emulsion emulsified with PEG-60 Hydrogenated Castor Oil (like BASF Cremophor® CO 60), thickened and stabilized with Carbomer (like Lubrizol Carbopol® 980 Polymer). The oil phase is made of an only light silicone oil : Cyclohexasiloxane. The aqueous phase contains polyols : Glycerin, Fructose, Glucose, Hexylene Glycol, Propylene Glycol and Sucrose, and a cooling agent : Menthoxypropanediol. The formula also contains a tightening polymer : PVM/MA Copolymer, that could be BASF Luviform® FA 139, that can be used in a wide range of cosmetic applications as binder, complexing agent, adhesive, film former. Here it is used as a film former, to help in the tightening and shaping sensation given by the formula after application. The formula is protected against microbiological growth by Methylparaben, Phenoxyethanol, Propylparaben, Sodium Methylparaben and Sorbic Acid, helped with Disodium EDTA. The formula is presented as a “dry oil”, which is the case regarding the oils used to formulate it : light silicone oil (Cyclopentasiloxane), light alcane oil (Isohexadecane, Isododecane), light fatty esters (Isopropyl Palmitate, Isopropyl Myristate). The claims are very “soft” on this product, claimed to “nourrish, smooth, satinate” skin, helped with very classical claimed active ingredient : Almond oil and Vitamin E.
– Tocopherol : Vitamin E, a natural anti-oxidant. As an anhydrous formula, the Oil is not a environment prone to microbiological growth : it does not contains preservatives. However, since it contains natural oils, it is protected against oxidation by Tocopherol (Vitamin E) as antioxidant. Anti-cellulite slimming formula, claimed to “reshape and smooth orange-peel skin” in 4 weeks. Would be efficient on silhouette, hips, knees, and tested on more than 100 women. Two active ingredients are emphasized : Caffeine and “Fibre-Elastyl“. L’Oréal Paris describes Fibre-Elastyl as follows on the glossary of its website : “firming patented active ingredient, result of 5 year research. It protects elastin fibers from degradation (in-vitro test), there are more of them, they are more resistant“. These properties could correspond to those of Acetyl Trifluoromethylphenyl Valylglycine, a patented active ingredient used in the formula. 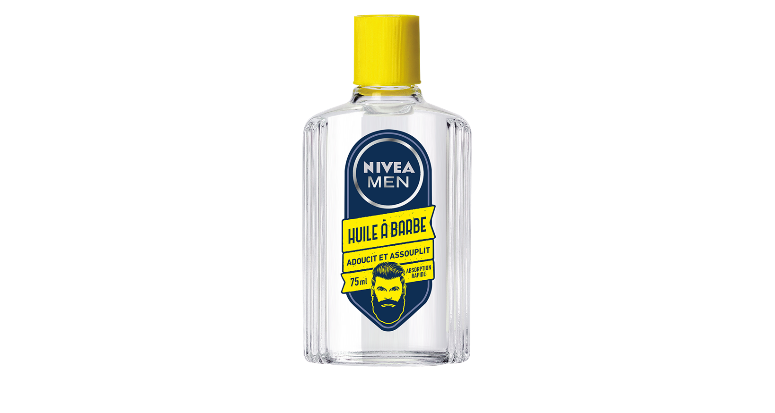 The formulation technology – an emulsified gel with an oil phase made of silicone oil and an aqueous phase containing alcohol – helps to massage the formula on skin, and improves its cosmeticity despite the presence of caffeine. The formula exhibits the following efficacy results : after 4 weeks, – 1.5 cm waist length, -1.2 cm thigh length. These results are not given on the front of the pack, but in small characters on the side. – Caffeine : commonly used in slimming products, claimed by L’Oréal to “clear fat surplus stocks”. – Escin : supplied among others by Indena, claimed to have anti-edema and vasoactive properties, and to act principally in capillaries. Escin is obtained from the seeds of the horse chestnut tree. – Acetyl Trifluoromethylphenyl Valylglycine : molecule patented by L’Oréal, and claimed to “treat body or face skin ageing, wether chronobiologic or light-induced, and in particular skin ageing caused by decrease of skin elasticity and/or by collagen degradation in the structure of tissues“. – Salicylic Acid : known for its keratolytic, bacteriocide and comedolytic properties. It also improves caffein solubility by forming a salt with it – Caffein Salicylate – more soluble than caffein in water. The oil phase is made of silicone oils : Cyclohexasiloxane, PEG/PPG-18/18 Dimethicone, Dimethicone, Dimethiconol. PEG/PPG-18/18 Dimethicone could be the Shin Etsu X-22-6711D (PEG/PPG-18/18 Dimethicone (and) Dimethicone). Regarding the composition of the formula (e.g. 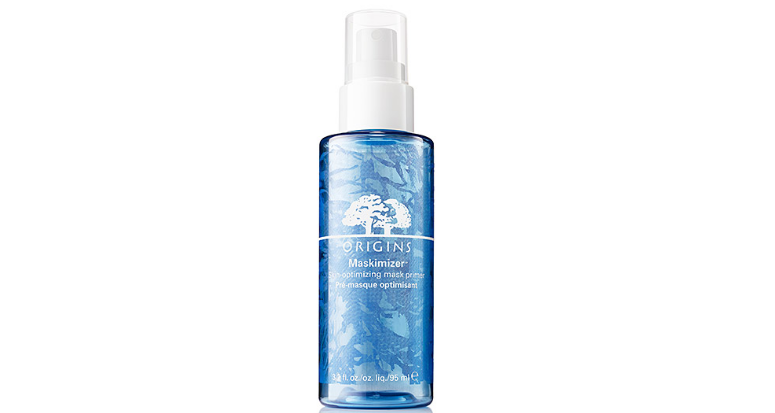 the polymers used), it would be more used here for its skin feel than as a W/O emulsifyier. The aqueous phase contains Alcohol Denat. The formula contains powders : HDI/Trimethylol Hexyllactone Crosspolymer, Silica and Mica. HDI/Trimethylol Hexyllactone Crosspolymer very probably corresponds to Toshiki Plastic Powder D-400 as patented by L’Oréal in a slimming composition. The formula is protected against microbiological growth by Alcohol Denat. and Salicylic Acid.